After a rougher than expected crossing our ferry finally arrived in Falkirk, France. 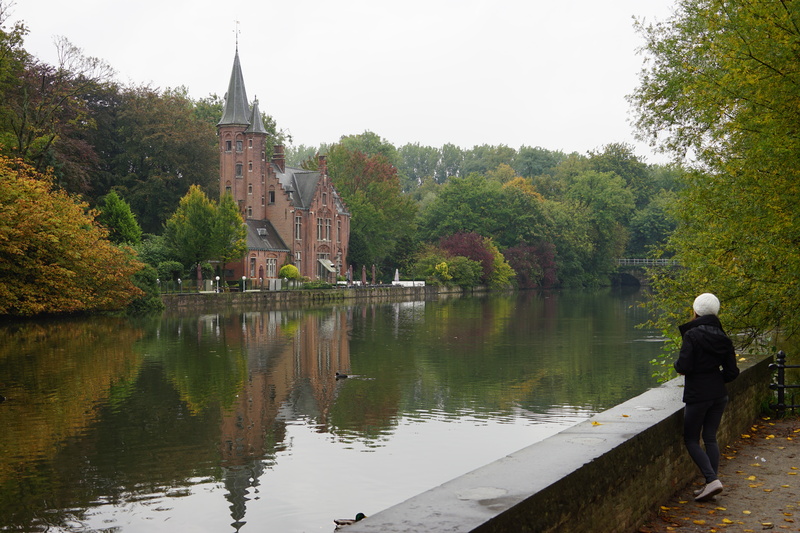 Thanks to paying an extra couple of pounds for priority loading our car was first off the boat and we were able to get out onto the highway ahead of the thousand or so freight trucks which were on board and start the drive to Bruges. 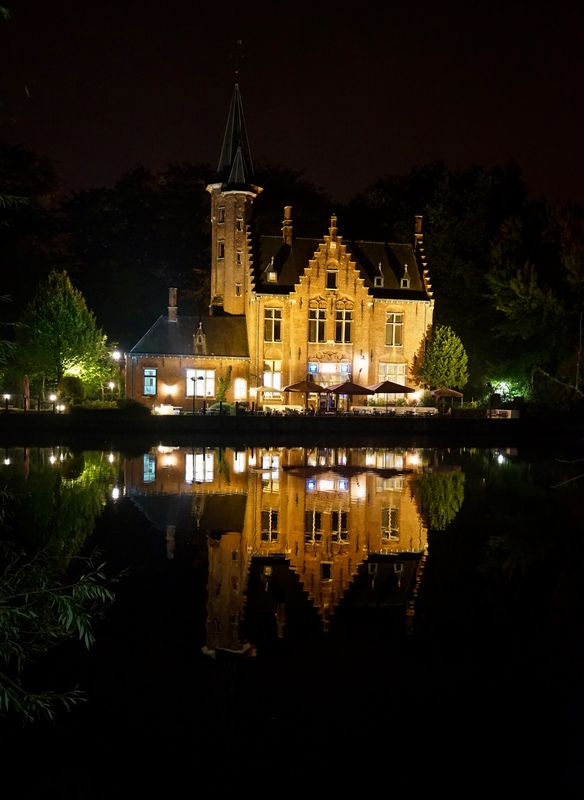 After twenty minutes we had crossed into Belgium and after just under two hours of scenic driving through the lowlands we arrived at B&B Huyze Uthopia, our base to explore Bruges. We have made a point of not talking about our accommodation in too much depth on the blog but these guys need a special mention, on arrival Carl & Willie sat down with us and went through the city map with us for fifteen minutes and pointed out all of the best places for photos, food and beer, they also put on the most elaborate breakfast you will ever experience, if headed to Bruges I can’t recommend them enough. 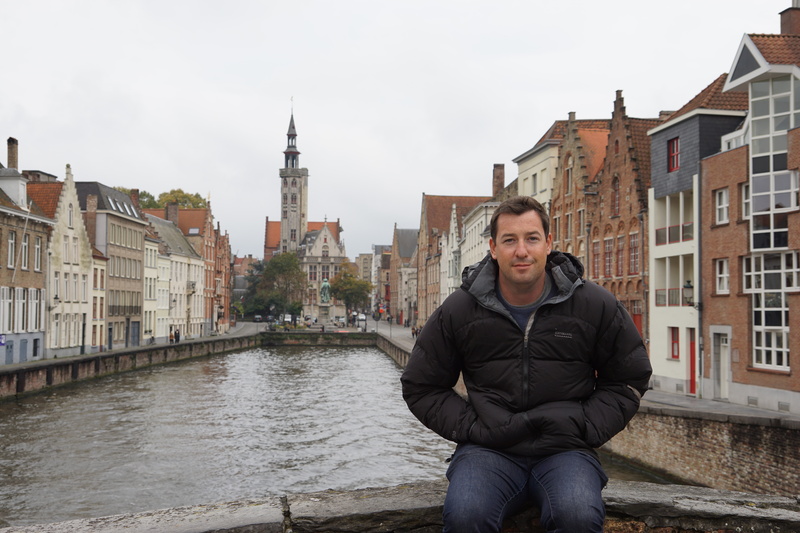 With all of their hints and tips in mind we headed off into the city, heading in around the Minnewater Lake and following the canals into the medieval town square and the various markets. 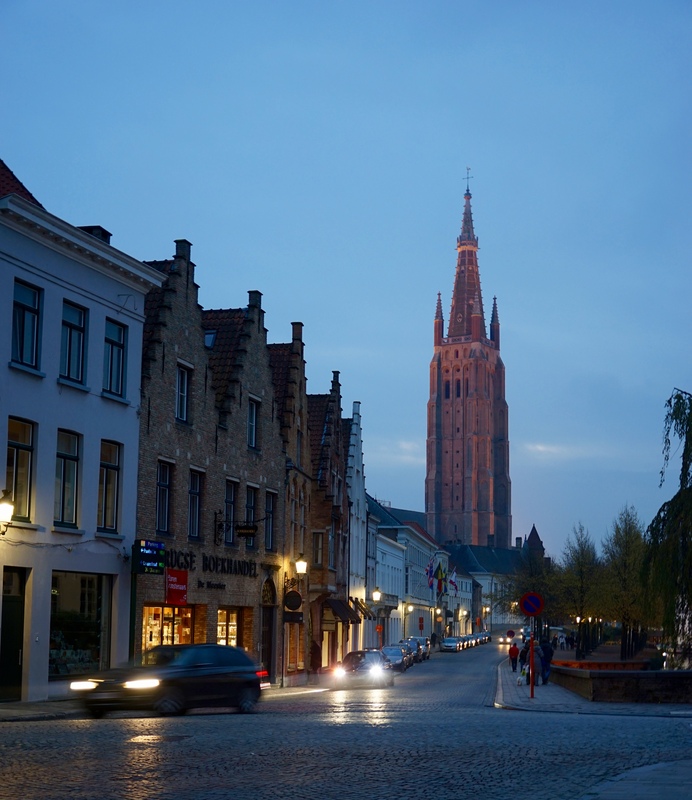 Bruges is one of the most attractive cities we have visited so far and without a doubt the best maintained. 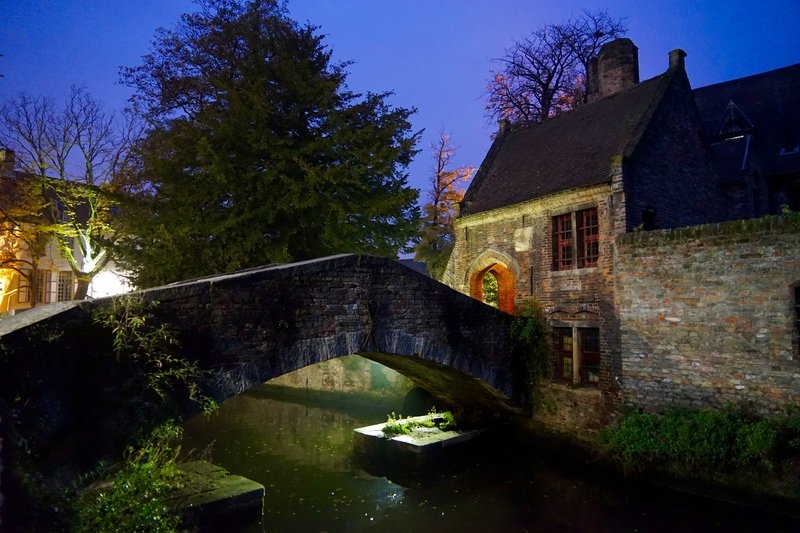 Lakes and waterways are everywhere, as are buildings ranging from medieval to 15th & 16th century right through to modern innovative designs. We had a great time wandering around exploring and taking it all in. Heading in to Belgium we were very aware of the big four for which the county is famous; Beer, Waffles, Fries & Chocolate and we were keen to start sampling as soon as we hit the city. 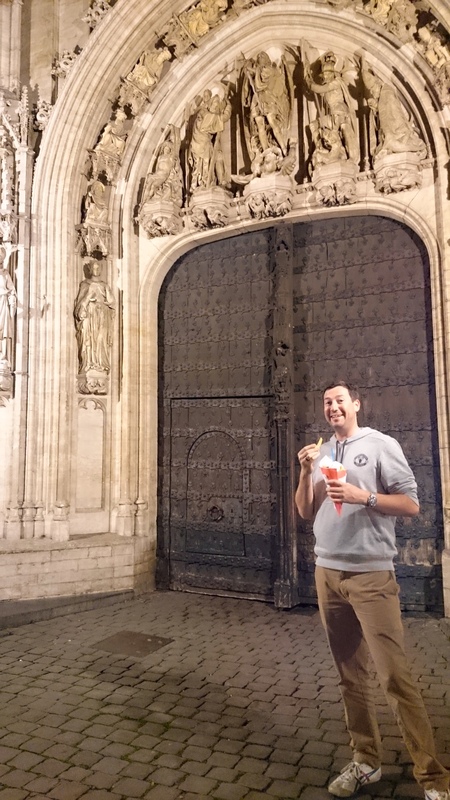 As with most cities in Europe there are plenty of high cost/low quality stalls set up around the square to catch the tourists, we were warned by our hosts that their food was particularly bad in Bruges so ventured a little further afield to start our gourmet safari. 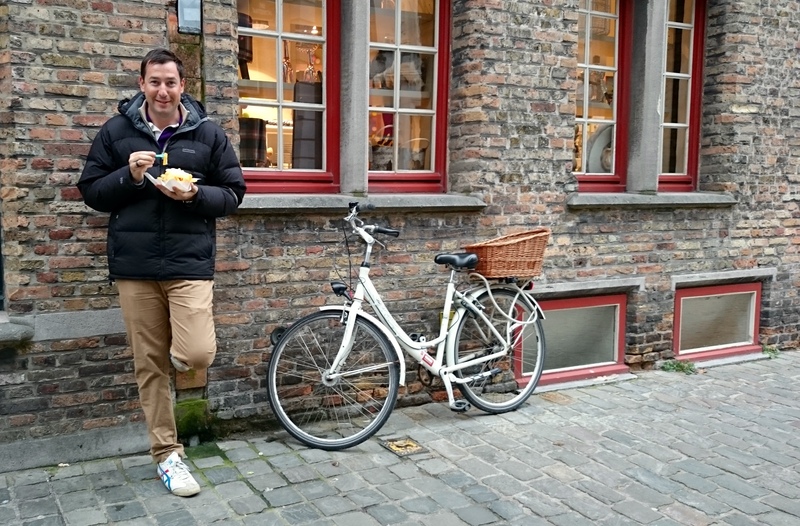 Our first target was to get some waffles as they seemed the most appropriate as a breakfast food, for a couple of Euros’s we were each set up with waffly goodness and were very satisfied with our choices, especially my banana and chocolate monstrosity. A source of much tension in the region for centuries has been the fact that “French fries” became the globally accepted term for the frittes popular throughout several European countries but invented in Belgium. 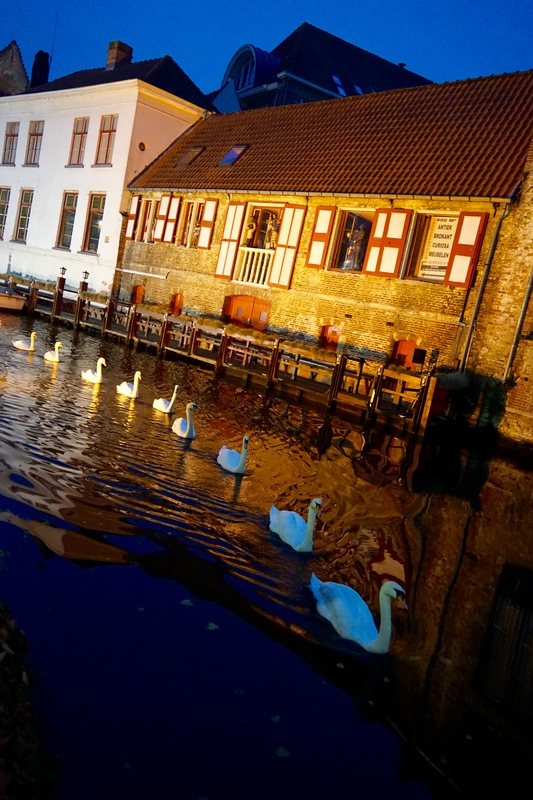 Bruges even has a museum to celebrate the double fried goodness of their delicious chips. The local recommendation was to have them with mayonnaise, it was a great tip and my main food source for the next four days. I won’t guarantee that they taste better leaning up against a wall next to a bike but it didn’t hurt. Beer wise you can’t really go wrong in Bruges, go into any bar and ask for the house pour or just get whats suggested by the bartender as most bars have unique specialty beers that cannot be found anywhere else in the world. 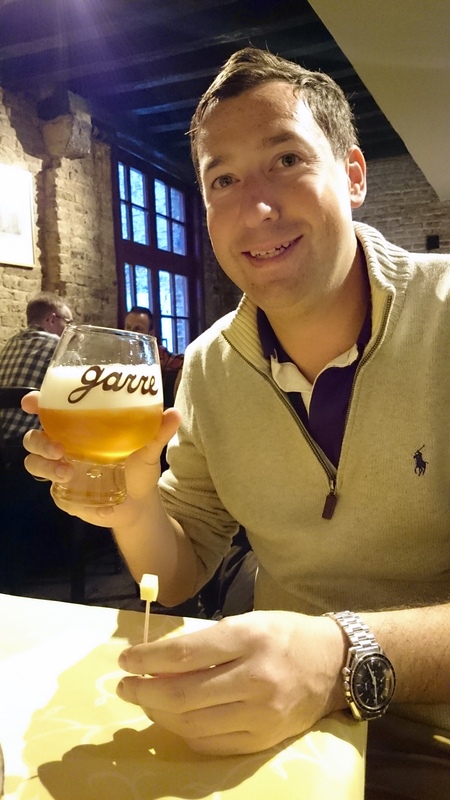 The one must visit beer destination in Bruge is De Garre, a hard to find three storey taproom hidden away down a tiny alleyway that runs off a side street. They have no signage until you get to the door yet despite that they were completely packed when we visited and we were lucky to get a table. Beer lovers flock here to sample the Garre house beer, an 11.5% masterpiece served with a side of cheese. You will struggle to find a more enjoyable beer, however savour them whilst you can as they will only let you have three in one session due to their potency and to make sure everyone gets a chance to come in and have a taste. It wasn’t all food and beers though, we also checked out the Historium, a quirky audio/visual guided experience through a variety of immersive rooms that gives an insight into what Bruge was like during the 15th century when it was one of the wealthiest and most important cities in the world. Maybe not for everyone but we enjoyed it and when it was coupled with a three beer tasting session in their terrace bar which overlooked the city square it was a good option for us! 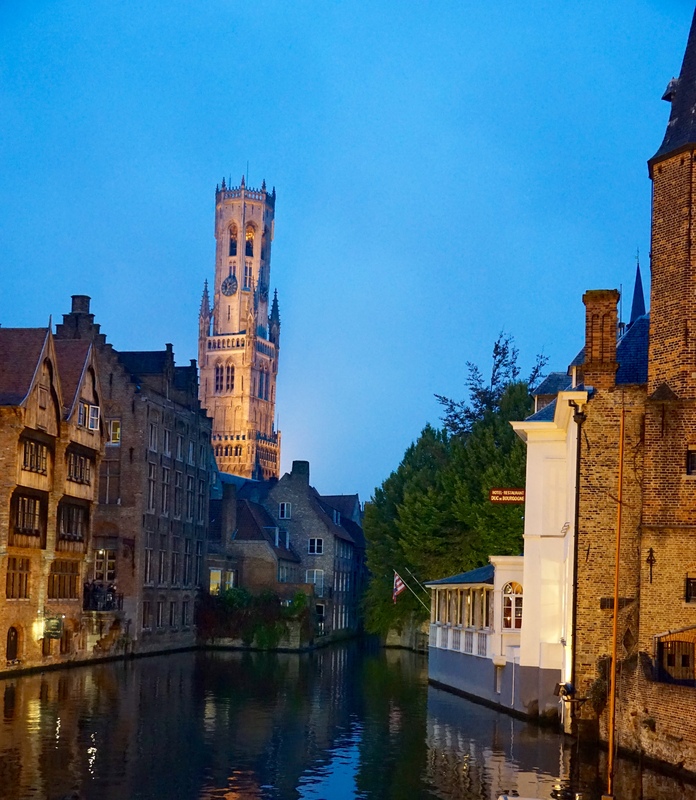 The photographic opportunities in Bruge were incredible so from dusk onwards on both nights we explored the city and spent heaps of time taking photos, they light most of the buildings around the canals in the evening making it a beautiful and dare I say it romantic place to go for a stroll. We were still to complete the big 4 because for some reason Jess was reluctant to invest in some Belgian chocolate because she doesn’t like the fillings they use in most of them. 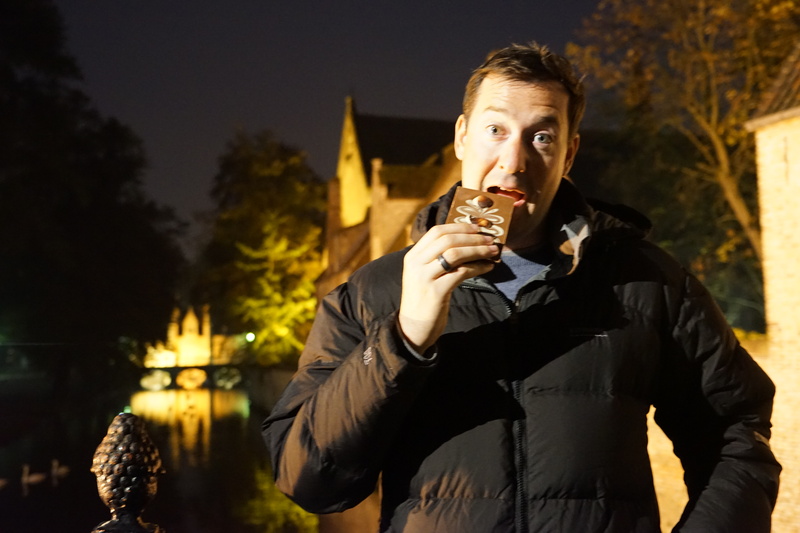 In between amazing photos I decided to take one for the team and tuck into some chocolate, thus completing our gourmet safari! 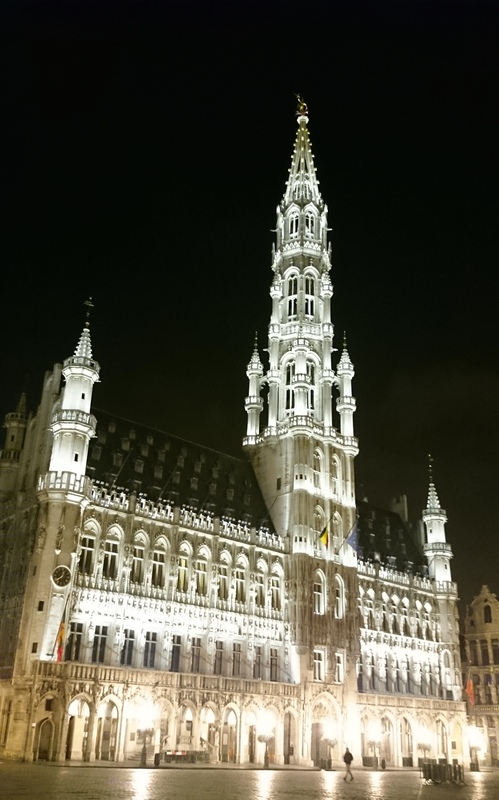 The next day we had a slow start and caught up on the blog and some bookings for the next leg of the trip before heading over to Brussels. The crazy traffic in the city wasn’t the most fun I’d had on the trip, nor were all of the crazy and unnecessary tunnels, I realised that my foolproof strategy of booking hotels on the outskirt of the city to avoid driving the CBD only works if you are smart enough to choose the correct side of the city. We eventually made it and after dumping our bags headed into the city and its famous medieval square. Brussels is a strange place to walk through as it still has amazing old buildings but many of these were knocked down and replaced with fairly rubbish office buildings or modern apartments in the 50’s, 60’s & 70’s to prepare for the World Expo they hosted in 1958 and when they became the base for the EU and NATO. It’s not hard to imagine how stunning a city it would have been now had they a little bit more foresight and common sense through that period of time when so much culture and history was destroyed. 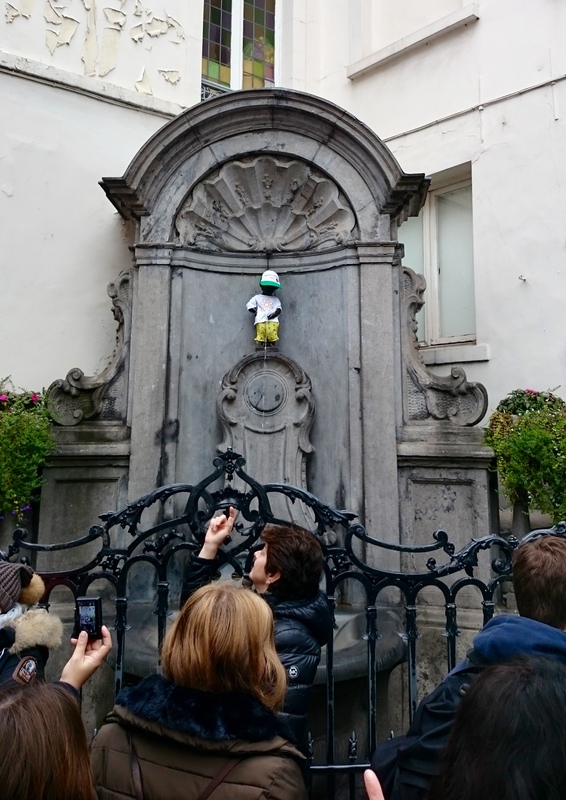 We saw the Manneken Pis, the tiny yet iconic statue of a peeing boy that they regularly dress up for events or themes and even occasionally run beer through. He was much smaller than we imagined and dressed up to raise awareness for a cancer charity when we visited, apparently they change his outfit up to three times a day so you never know what you are going to get. 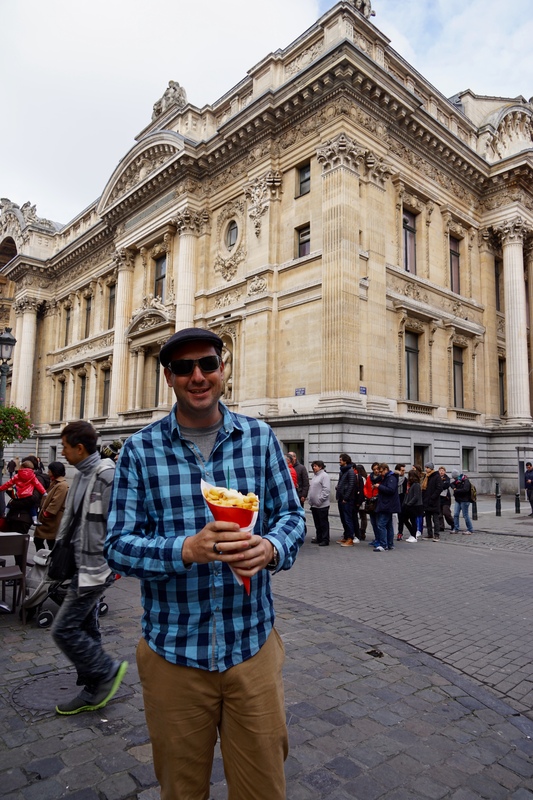 We also sampled the fries just to see how they measured up against the offerings from Bruges, if anything they were a superior fritte, despite this and in consideration of my health it was decided that the next day was to be a chip free day. 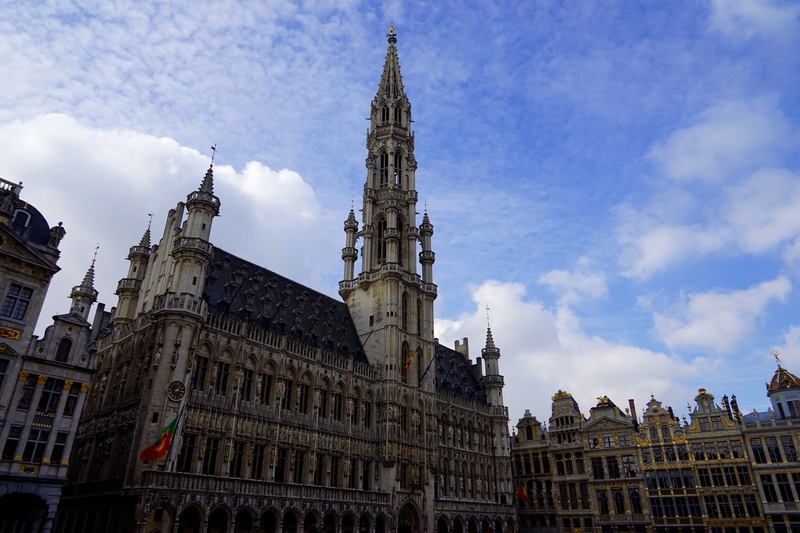 We began day two in Brussels with a savoury breakfast waffle before heading back to the medieval square for a free walking tour of the city through NiceDay Tours and our great guide Irene. 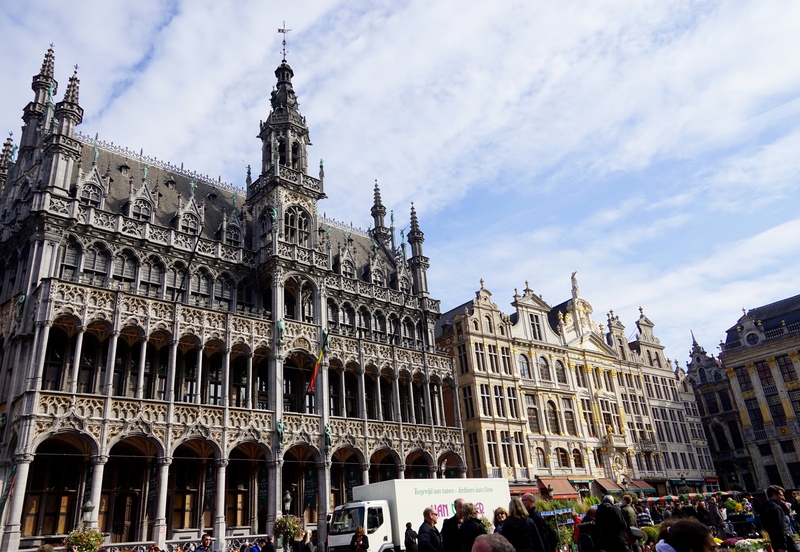 The tour went for almost three hours and gave us great insights into Belgium and its history as well as taking in the key monuments and historical sites in the city. 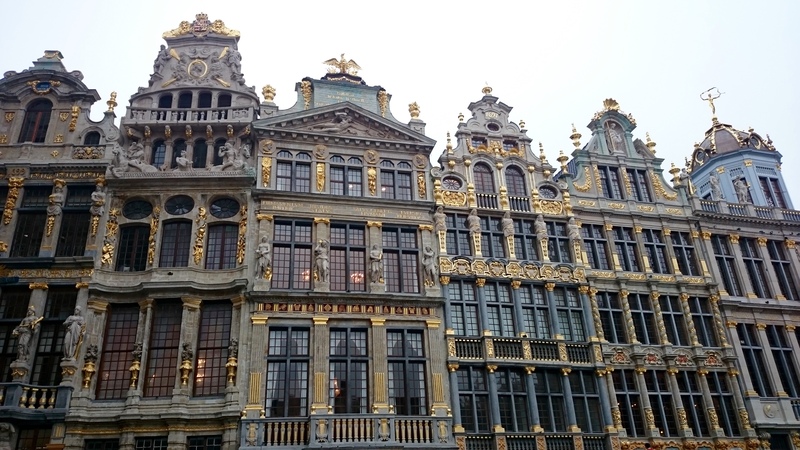 The tour also focussed on the best places to go for a beer and gave great advice on which chocolate houses to visit as well as organising some chocolate sampling at Godiva. It was when at Godiva we noticed a group of people sneaking chocolate straight out of the chocolate fountains, turns out they were Australians and a Kiwi and after a quick chat we were all best mates and ended up spending a few hours hanging out over lunch trading travelling stories. 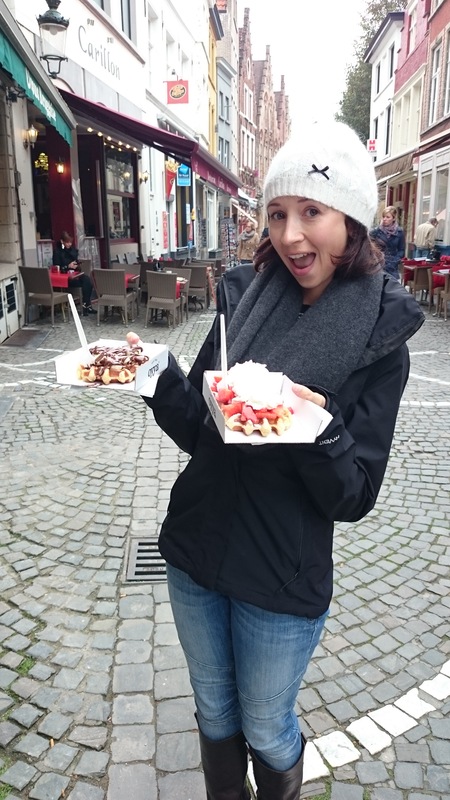 We split from the group after lunch for a few hours and Jess and I chased down our favourite Belgian indulgences while we still could. 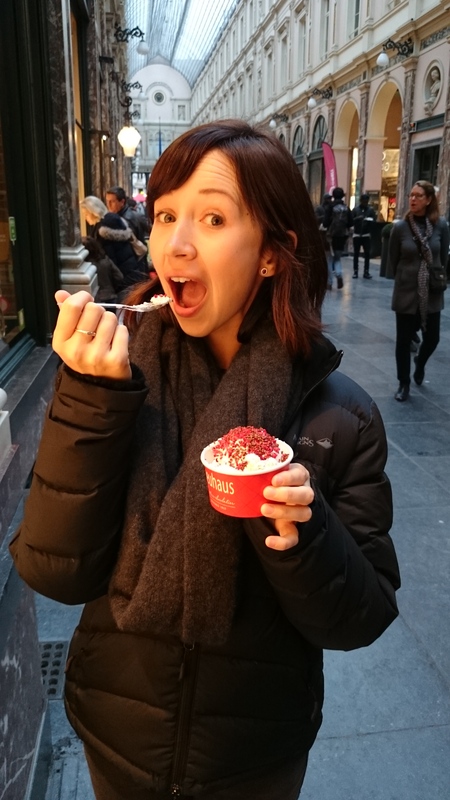 We did some premium chocolate shopping picking up extravagant and exotic boxes from Neuhaus, where Jess got an amazing white chocolate and raspberry mousse as well, and then from Pierre Marconi, Belgium’s master chocolatier and supplier to royalty throughout Europe. We are yet to break these open but will be sure to give them a mention in a future blog when the time comes, my money is on it being sooner rather than later. 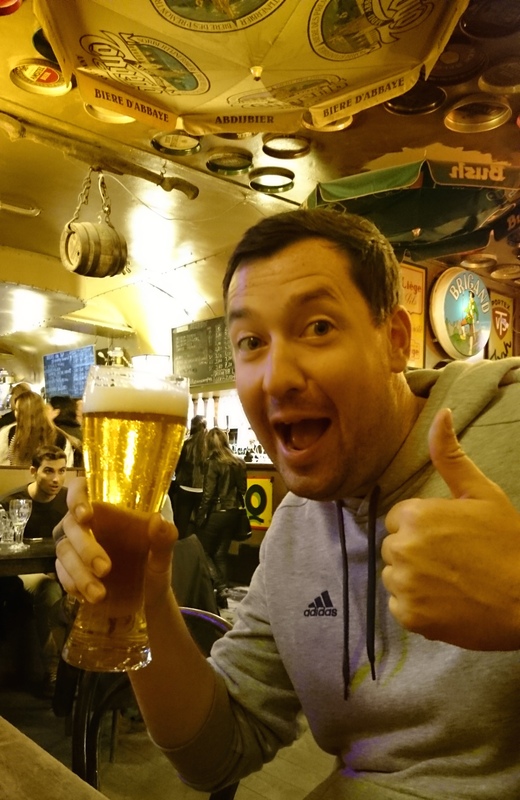 After our chocolate mission we headed to Delirium Cafe, the Guinness World Record holder for the largest beer list with over 2500 available on any given day, including over 1700 Belgian offerings. We met up with some of our new friends from the tour and had several pints with my favourites being the Delirium Tremel and the Guillotine Blonde, both packed a punch at 8.5% and 9% but went down very smoothly. After almost five hours in the cafe we thought it was time to head home considering we had a three hour drive the next morning, on the way Jess convinced me to go back to the square for one last round of photos. On arrival I looked at my watch and realised it had gone past twelve and it was technically a new day so immediately found the nearest frittes takeaway and loaded up on greasy goodness, having successfully navigated a day without fries. 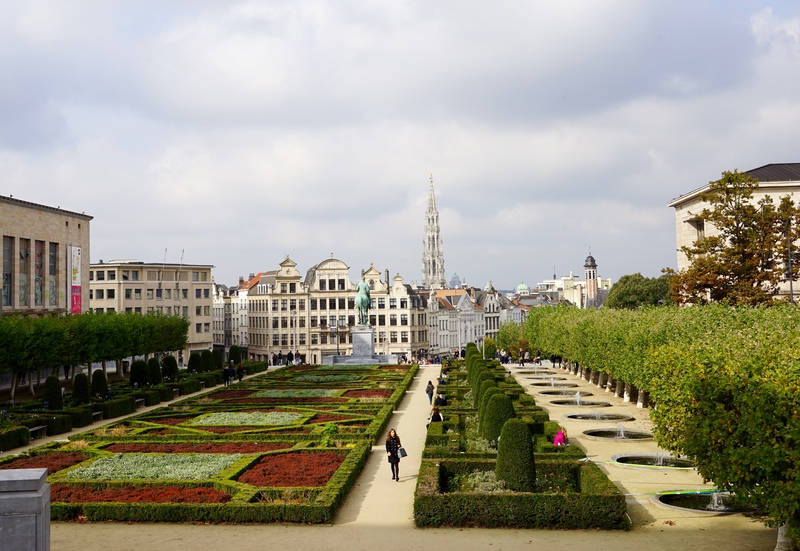 After a few quick photos and a cab ride back up the hill our Brussels adventures had come to an end. We woke up the next morning, me feeling miraculously fresh thanks to the restorative power of the fries, and headed off to Amsterdam to start the next adventure.